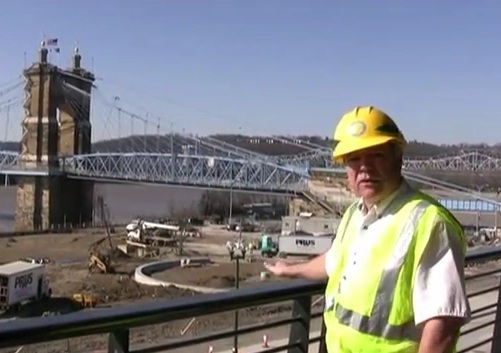 Smale Riverfront Park project manager Dave Prather has delivered yet another video update in what has become a fairly popular video series. This update goes inside the Moerlein Lager House which has now been opened for roughly two weeks, and highlights the progress of work on the water’s edge. Prather says that the grand opening for the Smale Riverfront Park will take place on May 18, 2012, and at that time will have virtually all construction work on the massive project’s first phase complete. He says that solar panels on the Schmidlapp Event Lawn’s stage will be installed next week, and that the first event will be held there on St. Patrick’s Day weekend. The 11:43 video also showed where historical markers and the location of home plate existed at Riverfront Stadium will be installed in the coming months. Visual progress is evident on the park’s second geothermal well which will produce 400 gallons of 57-degree water per minute. Progress is also noticeable on the foundation for the labyrinth and Black Brigade Monument. Prather also said that the most complicated piece of construction left is the work on the Main Street Fountain, and that there are approximately 30 to 40 construction workers on site each day taking advantage of the favorable weather conditions lately. Perhaps the two most exiting pieces of information from the video came at the end when Prather described the 1,000-foot boat dock that will eventually be in place and the approximately 300 trees that will be planted within the next month-and-a-half.